Yahoo! 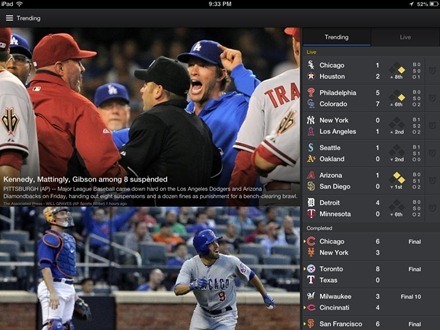 Sports is designed to be incredibly fast while still providing the in-depth sports coverage every true fan needs. Easy access to scores, news and stats in a clean, simple layout. 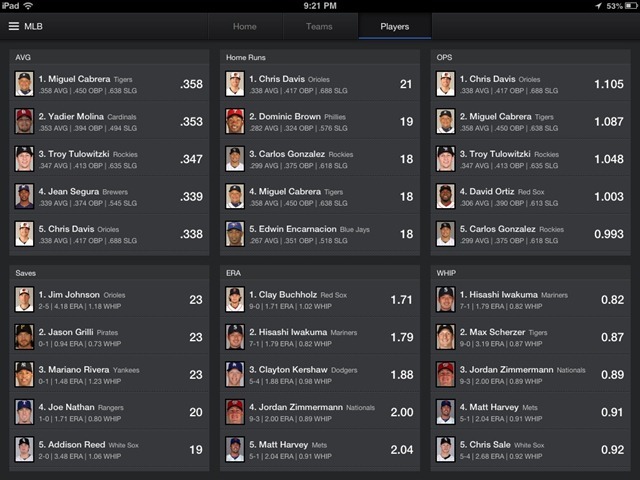 Get personalized live scores and information on your favorite teams, player, and leagues. 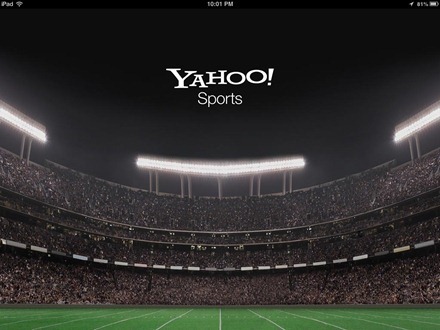 I’ve been an avid reader of Yahoo! Sports (along with SI.com) for many years – so this sort of coverage has instant appeal for me – and this app doesn’t disappoint. 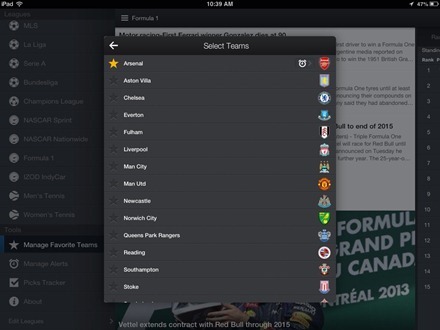 — It provides up to the minute scores across a number of major sports. 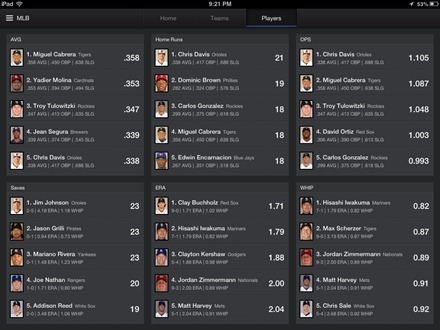 I really like the fact that it also offers standings and, especially, player stats and leaders for many of the sports. 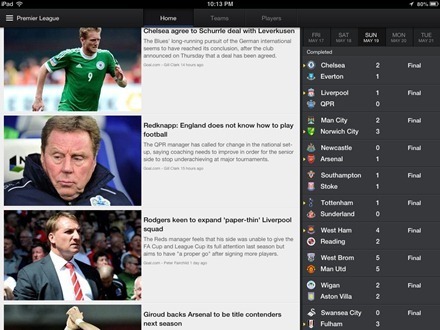 — It’s got good coverage of a number of international sports. This is something that’s very rare in a US-made sports app – most of them tend to begin and end with the NFL, NBA, MLB,NHL, and NCAA sports. 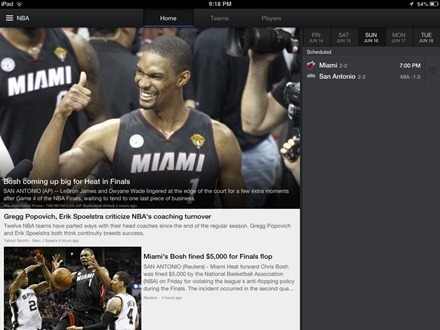 Yahoo Sports! covers Formula 1, Men’s and Women’s tennis, and the European golf tour. It also has some very good coverage of football, as in soccer – including sections for the Premier League, La Liga, Serie A, Bundesliga,Champions League, and the World Cup. The World Cup section looks weak right now though, with almost all player transfer talk and very little coverage of World Cup qualifying and teams. Even so, it’s good to see all these sections covering the world’s most popular sport. — You can select and track your favorite teams across all the leagues covered. — The Trending section is a fun place to keep up with the all the latest news and some of the crazy stories around the sports world. The app offers a number of In-App purchase options. Most of these are for alerts (for things like close games, NFL red zone and similar). I don’t feel I need any of these and don’t think the app suffers at all for not having them included. Here’s an App Store link for Yahoo! Sports. Hat tip to reader Will for giving me the heads-up about this app update earlier this week.